Lately, I’ve been thinking a lot about three women: Johanna Andersson, Ingar Jönsdotter, and Hanna Persdotter. A few weeks ago I plunged back into the Swedish records for ten days, focusing on my maternal great-grandmother and her Swedish roots. All I had to go on was an old book that I inherited from my great-aunt Caroline. It was “Family Book” that may have been given to her mother and father on the occasion of their marriage on Januari de 26 i 1893 in Chicago. The section titled “Our Ancestry” is, sadly, blank. Names, dates and stories that were forever lost when August Linden and Johanna Andersson both died early. 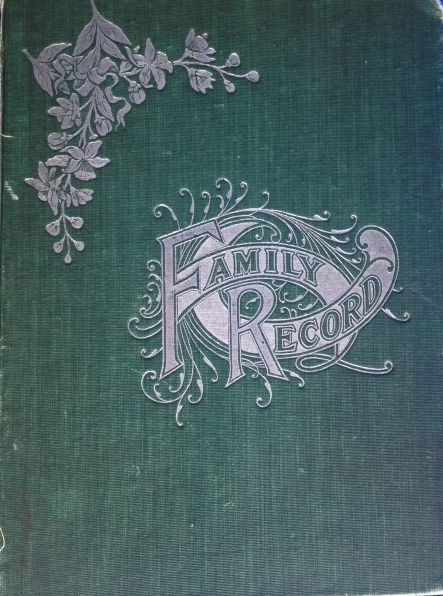 A few pages later, under the heading of “Our Family”, someone–presumably Johanna–did write some details in a mix of “Svedis and Englis” in pencil. Pages for the Husband, Wife, and three Children were completed. Birth: 4 Mej 1872 in the län of Skåne–Bjerstjäladugar, Sveden.Baptism: in Kjärrstorp socken, Sweden, by Pastor X. 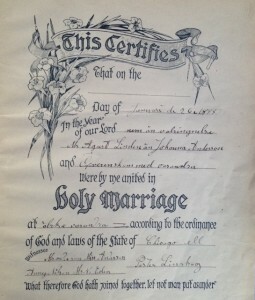 Converted or Confirmed: 1886. Education: Skol in Sveden. Occupation: husvarak an landres. Married to Agust W. Linden de 26 Januari 1893 in Chicago, Il. Residence 132 E. Superior St.Death: the 12 of October 1908. Died of canser. My first challenge was to figure out the names of the town and parish (socken). Someone had repaired a tear with tape long ago–right over the name of her parish–now it is discolored and difficult to read. It took awhile but eventually I found a map of hundreds in Skåne, and located a parish labeled Öster Kjärrstorp. 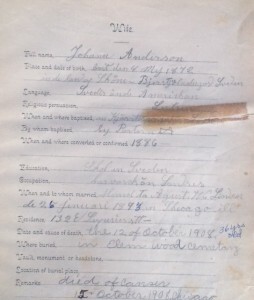 I signed on for another week of ArkivDigital and found the parish, and then the Birth & Christening Records for 1872. It didn’t take long at all to find May 4th and Johanna’s name. Johanna was indeed born on May 4, 1872. Her mother was “Pigan” (maiden) Ingar Jönsdotter and there was no father listed. In later records, Johanna has the word “oäkta”(illegitimate) written alongside her name. I spent 10 days obsessing (as before) my way through the records, searching for clues about the lives of these women. By the time Johanna was 3 years old, she was living with foster parents and Ingar eventually went on to marry and have three more children. It does not appear that Johanna ever lived with her mother in her new life. She took on the surname of her foster parents, first as Andersdotter, later as Andersson, and eventually Americanized it to Anderson. When she was 9, her foster mother died and her foster father remarried a year later. By the time she was 12 or 13, she was living, probably as a maid, away from her foster parents, and by the time she was 20 she was headed towards Amerika. Johanna’s mother, Ingar, was also born to an unmarried woman named Hanna Persdotter on December 1, 1825. At her baptism nine days later, a young man named Jön Jönsson was one of four witnesses and I’m guessing that he was the father since Ingar was always known as Jönsdotter. Hanna also eventually married (not Jöns Jönsson) but I think that Ingar grew up in her home, as her stepfather attended both the baptism of her daughter (Johanna) and her wedding. I was able to follow the families through several moves and many years. Johanna’s foster father (and family) and her mother’s new family both lived in the area for many years, dying as old folks. By then, of course, Johanna had emigrated to Amerika. 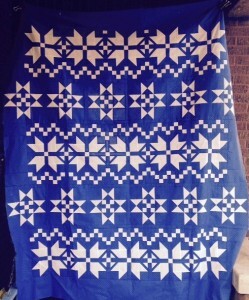 I’m planning to quilt a family tree into the design of my Swedish quilt and like the idea of three lone buds representing these single women who gave birth and most likely lived, at least for awhile, in difficult circumstances. I don’t know their stories, but I wouldn’t be here without them! And so my quilt will somehow honor them. I doubt if they were honored much in life. Perhaps they didn’t even deserve honor–and yet, grace surrounded them. 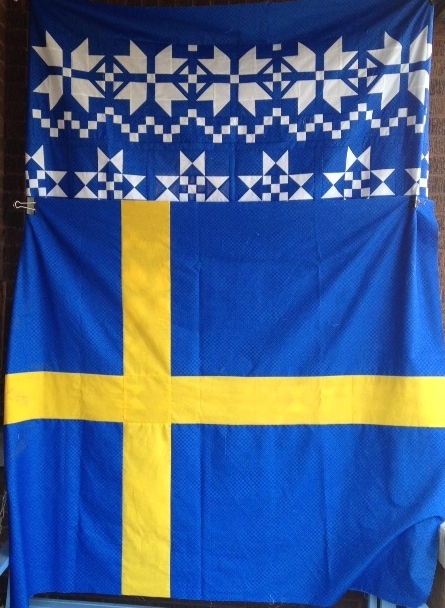 Here is my finished quilt top and the Swedish flag I made for part of the backing. I hate to admit this but I am addicted to my Swedish genealogy project. 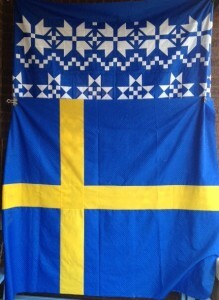 I’ve been happily pursuing my interest in my Swedish family. I signed up for a beginners Swedish Language class at North Park College, thinking that going into the city would also “force” me to spend a little more time out in the field researching. North Park is located in the area where my mother was born (Swedish Covenant Hospital, which is disappointingly modern) and grew up. It’s not too far from the cemeteries where some of my grandparents and great-grandparents are buried. It also is not too far from the Swedish-American Museum, Swedish restaurants, Swedish bakeries and The Sweden Shop. But this week I took a small dose of a gateway drug and now, I’m completely addicted. For about $10 US ($88 SEK) I signed up for just one week of ArkiDigital, an online site for Swedish Genealogy. Oh my. For a genealogist who started with paper records, actual snail mail letters and the Newberry Library, graduating to microfilm and microfiche, and then on to Ancestry.com, this is simply amazing. With the click of my touchpad, I can scroll through pages and pages of original records in color from 1650-1940, some recorded at the time of America’s Revolutionary War. I can zoom in and out, rotate the pages, print them or save the image to my computer. Yesterday I got an email from ArkivDigital suggesting that I might want to renew my subscription because it was going to run out at 2:42 CET on February 9th. I entered Stockholm into my World Clock and figured that meant sometime around 7:42 tonight and started clicking even faster, trying to “save” as many records as I could find. I stayed up too late last night and grabbed my computer when John and I headed to the ER this morning. I clicked away while they poured IV fluids into my somewhat dehydrated husband. I took some time to nap and talk to a real live cousin today, but soon opened up the computer and started clicking away. I was actually hoping to be on line when the notice came up saying that my subscription had ended. It is now 8:04 pm (CST) and that hasn’t happened yet. It’s like I need the subscription to end so my addiction is cut off. Oh, I know I will sign up for another week or month(s) but for now, I need a break. I have enough sources that it will take me quite awhile to figure out what I have, what more I want to look for, and what questions I should be asking. I still have 8 more weeks of Swedish classes, more places to visit, more leads to follow. 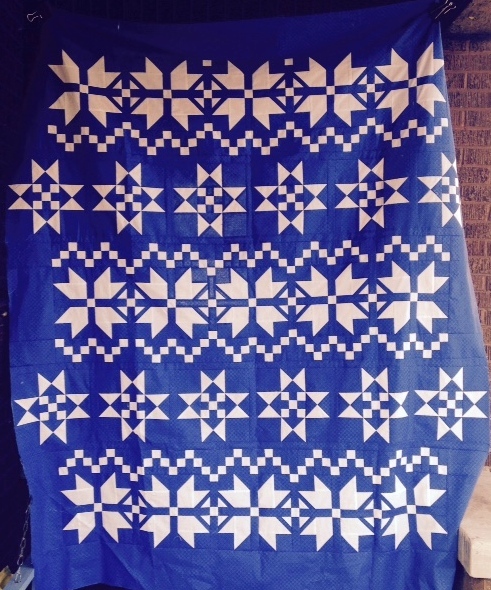 Oh, and did I mention that I decided to finish a Swedish quilt at the same time? I’ve even been neglecting that this week. But I’m strong. Even though the subscription still hasn’t expired, I’m going to shut down the site and stay off of it–for now. Cold turkey. My name is Kristina and I’m a Arkiv-aholic. I am feeling incredibly blessed tonight. Dad steadily improved in the hospital and was discharged yesterday. We were able to settle him into the skilled nursing/rehab facility that is connected with his current independent living complex. We hope that he might be able to become strong enough to transition to the assisted living area, to regain at least a measure of his independence. What could have been a hard, frustrating day, wasn’t. We were able to facilitate an early and simple discharge and Dad accepted his new residence with grace and gratitude. Last night when he prayed, he was in awe of how God had provided for him so well. I can tell you that is not a typical reaction to a nursing home admission. Today Larry moved a little bit of his furniture to his new room, making it feel a little bit more like home and Connie and I labeled all his clothes with a couple of really cool little machines provided by the home. I sat with Dad through all his meals and spent most of the day quietly in his room. He is still weak and unsteady, but moves slowly and carefully. During his last rehab he learned to use a wheelchair to move around and really does quite well, though best with someone there helping/coaching him. He was evaluated by PT and anxious to start working to gain strength. After dinner he was so tired that he was ready for bed (6 pm.) He went into a deep hard sleep in his recliner, sleeping through Larry and Connie’s visit. When he eventually woke up, he got up and got dressed for bed but then wanted to sit up a bit longer. We started talking about his mother and his step-father. I’d spent time with my grandmother in her very late years and watched her age with much grace and an ardent desire “to go home.” I am seeing the same spirit in my Dad. He also talked about the ways God provided for him in sending Laurence Christie into their lives. We talked about Mom’s Swedish heritage. And we talked about the blessing of children, grandchildren and great-grandchildren. And then I suggested that we pray for our family. After Dad started to pray, I briefly contemplated grabbing my I-Phone and recording it, but I did not. It was so sweet to listen to the heart of this old man who reminded God five or six times that he was ready to come home, but trusted God and thanked him for his care and provision. He thanked him for years (89) of care. “You are good. You are gracious. You are merciful.” I believe he prayed for about 20 minutes, as a man conversing with a good friend. He prayed backwards and forwards, appreciating God’s goodness in the past and looking for future answers as well. I remember driving around Scotland wanting to drink in the peace of the rolling green hills and pastoral scenes. (I had two small children at home at the time and wanted to store it up for the future.) I feel a little bit like that now, wanting to savor these moments with my father. I know that this is just a temporary stay of the inevitable, but it has been so sweet to sit by his bedside, to help him make this “overwhelming” transition, but especially to pray with him and listen to him pray. I’m 41,000 words into the month of November, back to work three days a week, and frustrated that there aren’t enough hours in a day. Sleep feels like a necessary evil and an evasive pursuit. My first question is: “Why do I do this to myself?” and then I wonder how I can pack more into my day? My current project has been to process genealogy details for my Swedish family (and writing about it for my 50,000 word project.) A few days after I last wrote I decided to sign up for Ancestry.com worldwide. I started entering our family tree and followed the “hints” as they popped up. One thing led another and pretty soon I opened emails containing pages of details about some of our Swedish ancestors. (The source person ended up being a 6th cousin one way and a fourth cousin, once removed another way.) I printed 64 pages of “notes” from just one of the emails. I did manage to make a tunic for Kellen’s party. 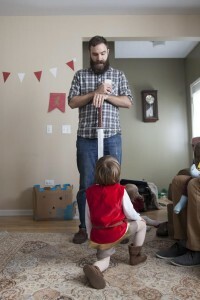 He was knighted “Sir Kellen” in honor of his 4th birthday with the not-so-secret agenda of encouraging him to move into the 4-year old stage with a new level of obedience and cooperation with his Liege Lord(s). Laura planned a party that was both relaxed and full of fun details and decorations. There was a dragon pinata to slay, miniature catapults throwing mini marshmallows into the cups for hot chocolate and plenty of swords and shields. I love the details–at parties, in a story, and in life. Adding a couple generations to the top of my family tree doesn’t do the trick. Deciphering the details of names, dates, and locations tells me stories that help history to come alive. For example, Peter Svensson and Caterina Persdotter lost four children to smallpox within the span of one week, three of whom died on the same day, February 15, 1800 and one on February 23 (ages 8, 5, 3 and 1.) How do you live through grief like that? That would have wiped out my whole family. Fortunately they had other children who survived, or I might not have been born. I am enjoying all this but I can’t sustain it, especially through the month of December. And I know myself well enough that once I set it aside, it might languish for several months while I focus on something else. I’ve been thinking a lot about birthdays this past week. Last Friday, February 28th, was Laura’s 30th birthday. She was hoping that it might be a BIRTH day as well, but it ended up being a day of celebration with her son (during the day) and husband (dinner.) I spent time thinking about my 30-year old self that had delivered Laura that year and the feisty and fun little girl that she had been. A letter found amongst my Mom’s things, had reminded me of how much I’d enjoyed Laura at 11 months. 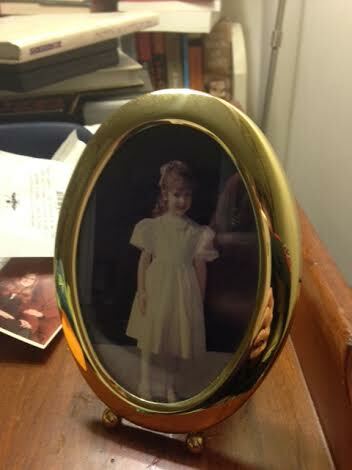 I’d also brought home this framed picture of Laura that had been on my Mom’s dresser for many years. The next day, March 1st, was my Mom’s birthday, another hoped-for birthdate for this new baby. I received an email reminder from Myheritage.com of her birthday and a suggestion that I might want to send her a message. So I did: I enjoyed imagining her first heavenly birthday and also caught her up on the news here. It was a day of mixed emotions, many tears, and a lot of frenzied activity in Detroit as they finished the final touches of preparing to put the house on the market next week. They picked up the key to Dad’s new apartment and moved some of his excess furniture and many boxes to the new place. He will wait to move after the condo is sold, but the process has begun. The day passed without the hoped-for birth of great-grandchild number nine. And finally, early this morning, March 4th, Oaks Samuel Birkey was born! Laura and Taylor labored most of the yesterday while we entertained Kellen and waited for our grandson’s arrival. I stayed up late (knitting) and then didn’t sleep well with my I-Phone at the bedside, sending and receiving reports of his progress. Not only were we waiting to hear news from Taylor, but we were keeping in touch with Anne while she waited on the other side of the world for the news. We were invited to meet our grandson around 5 a.m., and of course, we dressed quickly and made our way to the hospital (where Laura was born) to see him. It was fun watching Kellen meet his new brother, his “baby that was borrrrn.” He told him that he shouldn’t be afraid of him, because he wasn’t going to hurt him. (He said the same thing to our dog Luna yesterday.) 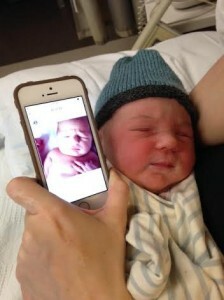 This is Laura holding up one of Kellen’s birth pictures next to the new baby to see how much they look alike. Three emotion-filled birthdays. Four generations, with me–the second generation, now the “old” one in the lineup, sandwiched in the middle. Celebrating my adult daughter; missing my mother, and welcoming a sweet new baby in our midst. I think I’ll sleep well tonight. I finished writing over 50,000 words this month to earn my second NaNo badge on 750 Words, a site I have used for daily writing since June 2012 (and love.) November is National Novel Writers’ Month and so the last two years I’ve taken on the challenge of writing 50K words and attempting to work on a fictionalized story about my Gramma Christie’s life. Last year I wrote a Prologue and a few sketches. I also did a lot of research on her second husband, Laurence Christie. When I started we knew very little about him except that he had come from the Shetland Islands, shared the same boarding house with my grandmother’s first husband, worked in the commercial real estate sector (pre- and post-depression), married my grandmother in his 50s, and died seven years later of a bleeding gastric ulcer. I found his family in Cunningsburgh, Shetland, learning that his older brother suffered from bipolar disorder but was a talented musician, writer, and stone carver. Laurence emigrated to Chicago in 1907, where he worked hard enabling him to send money home to help his family and also likely helped a sister-in-law and nephew come to the States. He met Bob Marshall by 1910, when they shared the same boarding house (and were entered on the US Census on consecutive lines.) Robert Marshall died tragically in 1925, hit by a train as he was commuting to the family’s new summer home in Cedar Lake, Indiana. My grandmother was expecting my father at the time. 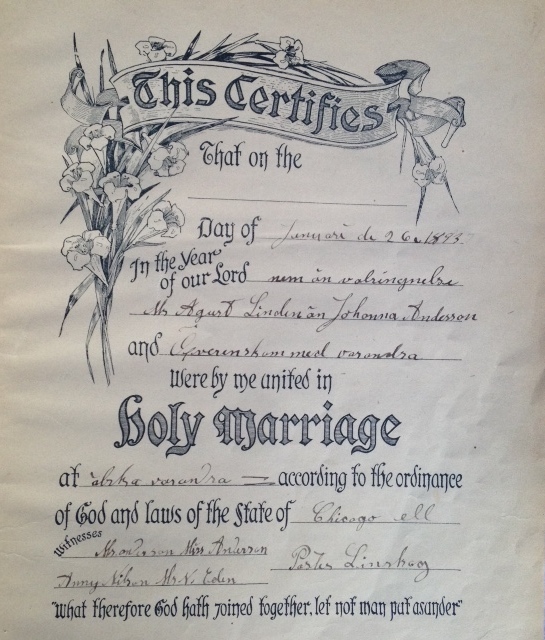 Thirteen years later, Laurence married my grandmother. I have enjoyed being in contact with Pat Christie, a native Shetlander and family historian. Her husband is the grandson of the son that stayed on the croft and took care of his and Laurence’s aging parents. She has sent me pictures and letters and answered a lot of my questions. 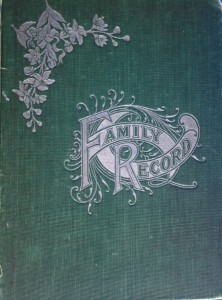 We’ve shared our genealogical discoveries and information. This November I tried hard to understand the times and context of their lives and wrote a lot of what I call sketches. I would take an event that I knew had occurred and write about it from that person’s imaginary perspective, adding details to the story that I thought were reasonable: what it must have been like for fourteen year old Laurence the night his older brother was taken away to an asylum; my grandmother’s thoughts when two men knocked on the door of her summer cottage to tell her that Robert had been killed by a train; Laurence’s thoughts on his long wait to marry; and so on. I’ve been pretty focused on stories. I’ve journaled for years but when you stop writing the facts or even feelings about what happened, when you start telling stories, something different happens. I’ve found it really fun. I best remember by grandmother in her early 90s, bed-bound and unable to see well enough to read anymore, telling me that God was good to keep her hearing intact. Earlier in her life, she chided two of my cousins for their assessment of the “tragedy” of her earlier life saying “There are no tragedies in life.” My grandmother wasn’t in denial: she simply believed that God was sovereign and that He was good. Today my Dad prays “God, You are good, You are kind. Thank you.” And then he tells me that “God is in control,” even when he struggles to believe it. I am in the middle of so many stories and I’ll bet you are too. Let’s share our stories and keep reminding one another that God is good, that it is–in the end–God’s great infinite story that we all get to share. * I googled affect vs effect, but I’m still not sure if I used the right one. What do you think? I also know that I don’t technically spell “Gramma” correctly, but it’s the way I’ve always spelled it and I have emotional connections to my spelling, so I will continue. Just saying. I just came home from an appointment where my last drain and all my steri-strips were removed. I was also “released” from the super-sized, super-uncomfortable surgical bras that I’ve had to wear 24/7 for the last 13 days. We bought two “Genie Bras” (as advertised on TV) on the way home and that feels so much better. Sorry guys, I know that’s TMI, but I bet my women friends understand. I was also released to start minor range of motion exercises which involve–literally–letting my fingers climb up the wall 4 x a day, both facing the wall and from a 90 degree angle, with a little extra push of maybe an inch beyond what’s comfortable. I thought I was already climbing walls. (Yesterday I spent most of the day in the living room to gain a change of scenery.) I’m looking forward to a few car rides and starting to walk as soon as spring decides to descend on the Midwest. This is a picture taken by Steven Christie of a “sundog” phenomenon in March 2013.